Singer-songwriter and folk interpreter Mae Robertson is my kind of person: a lover of cover songs, and a true fan of the environment, who ran a chain of New York natural fiber children’s clothing stores for twenty years before returning to Alabama in 2000 to pursue her musical career. Many of her albums to date have been released as part of her Lullaby & Lovesong Collection, which has won numerous awards in the world of parenting. And the brightly-colored, flower-shaped plantable business card she sent along with her newest album, the aptly titled Meet the Sun Halfway, really won me over. If this were a blog about cool people, I could have stopped there. But though it was the flower-shaped business card, and the personal note that accompanied it, which caused me to give Mae’s work a second listen, it was the music which ultimately won me over. And that’s saying something. Because for most of my life, I’ve dismissed Mae’s sort of music. And now I think I owe some people an apology. Mae Robertson comes from a school of folk way on the other end of the spectrum from the lo-fi, sparse, acoustic folk which characterizes the current indiefolk movement. This is folk for those who love Joan Baez, Judy Collins, Linda Ronstadt, Emmylou Harris, and others in the rich-voiced songstress vein — strong-voiced women who are primarily singers and interpreters of song, rather than storytellers or songwriters per se. It’s not generally my favorite branch of the folkworld. And, I’ll be honest, at first I didn’t think this was going to be my cup of tea. But Mae has a lot going for her. Her organic business sense parallels themes of growth in her song choices and, increasingly, in her own emerging songwriting, which is surprisingly direct and vivid. She has an exquisite taste in folkworld cover songs, and an uncanny ability to pick songs and lyrics which best match her sweet, pure alto voice. The emotional honesty and carefully tuned craft she brings to her work is equal to the greatest of the words she sings, whether they are her own, of those of others. And her warm, bright delivery is like the sun itself. Like much of this sort of Adult Contemporary folkpop, the way in which we hear Mae’s voice is subject to the whim of the producer, and in this case, the production on some songs is a bit too strong for my own taste. This is a common complaint for many folkfans when faced with this part of the genre, I suspect — I had the same reaction to much of Shelby Lynne’s newest coveralbum. But as with Shelby’s work, the songs here run the gamut, from sparser work in the americana folk vein all the way to the jazzpop stuff, and there’s plenty of gems. Even when it works, the heavy, almost syrupy production Mae Robertson chooses for many of her best covers can take some getting used to. It’s startling to hear the likes of Lucinda Williams and Gillian Welch covered in such dulcet tones, and with such lush orchestration. But like the seeds that will sprout from her business card, this is music that truly grows on you. It says something that I’ve continued to listen to these CDs long after I first sampled them. There’s a warm, celebratory tone in Robertson’s voice, and a genuine love of the songs she sings which shines though to the heart. My kids hear it, too. Of all the CDs I’ve recieved, these are the only ones my older daughter has asked about; when I asked her why, she said “I like this music; it’s really pretty, and really nice” — high praise, from a five year old. It’s also the only folk music that both kids will dance to. They twirl and smile, like full-grown music box ballerinas, when I put Mae Robertson on. Believe me, this is music that will stay on the turntable for a while. Why not take it for a spin yourself? 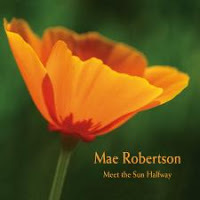 Meet The Sun Halfway was released in February; it includes more stellar covers, and some sweet and cohesive originals from Mae Robertson herself. Cuts above also come from Mae’s two all-cover albums: last year’s gorgeous award-winning lullaby collection Dream, and 2002 release Smile, which has the lightest production of the three CDs mentioned here, and features such back-up folk and bluegrass luminaries as Tim O’Brien, Viktor Krauss, and Sloan Wainwright. Pick up these, and sample all of her previous albums, at CD Baby (Mae’s preferred source) or via her website. Today’s bonus coversongs, because Mae Robertson’s fondness for Beth Nielsen Chapman sent me to the stacks.